The Corn Store is a beautifully restored barn on Ropers Walk Farm with breathtaking views in all directions. The location is extremely peaceful yet only a 2 minutes walk to the local amenities including childrens playground. The lively village of St Agnes and the great surfing beaches of Porthtowan, Chapel Porth (home to the infamous hedgehog ice cream!) and Perranporth are 5 minutes drive. 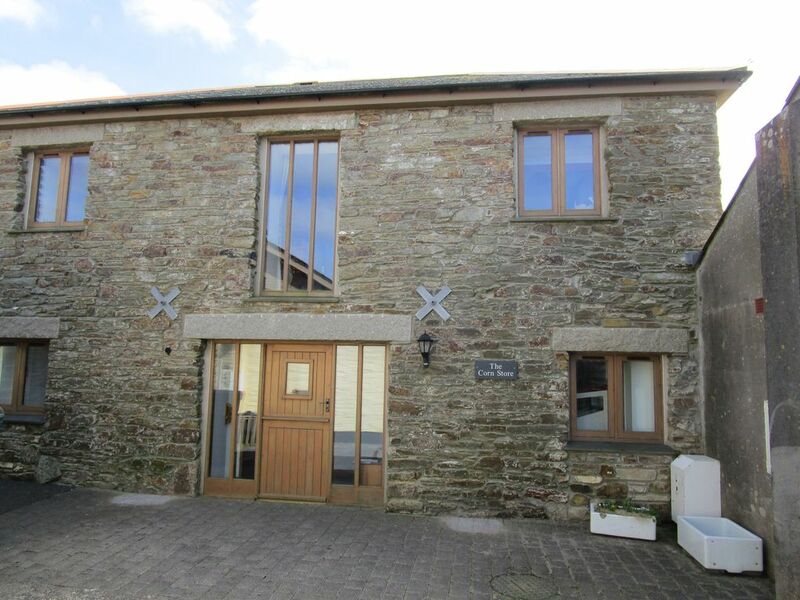 Set in the heart of the dramatic North Cornish coastline it is a great base for walkers, surfers and sightseers alike. The accommodation is upside down to allow you to make the most of the great views. With a modern kitchen and studio upstairs and a peaceful bedroom and wet room downstairs. You will have free access to 40MB broadband during your stay and the TV is equpped with Chromecast. Outside there is a private sunny South facing garden because the Sun always shines in Cornwall!!! As well as the Cornstore's own private south facing, garden there is shared access to the garden at the front and a footpath runs past these over the fields to the scenic valley of Parc Shady and on down to Porthtowan. All guests are welcome to access our fields that lie to the front of the property. High-chair and cot are available on request. This property is next door to The Byre ref HAUK8193538 and can be booked together for friend/family groups to sleep up to 10 guests. We moved with our three young children to Mount Hawke from Devon 10 years ago to run our veterinary practice - Tom is a vet and I am a vet nurse. We live just around the corner form The Corn Store and absolutely love it here! The Corn Store is fully wheelchair accessible with a through floor lift. Milk, tea, coffee, oil, salt, pepper, biscuits and bottle of wine as welcome pack.